Capitalism is undergoing a severe crisis with enormous political and social implications. Needless to say, capital’s crisis has been pretty much permanent since the ‘70s. However, the disastrous nature of the present crisis does not bode well for the proletariat if the present order of things remains unchanged. It is high time to put an end to this barbaric system. Faced with the drastic austerity measures that the bourgeoisie has imposed on us, we’re seeing the organization of some true mass movements of struggle, from Greece all the way to America via Egypt. 1. The emergence of groups of the political vanguard brings the communist program to the very heart of the class struggles. 2. The involvement of 'historical' political organizations already existing within the proletariat, and the Communist Left. In other words, the development of these two aspects in the building of an international class party is sorely lacking in the current class struggle. The establishment of an organized and centralized vanguard to ensure a clear political direction for revolutionaries and communists advancing these struggles to victory leading to the revolution. The basic political positions for a regroupment of revolutionaries into a party are the legacy of the Communist Left, that is to say experience of different sections of the left that emerged within the Communist International in the '20s-'30s. The basic criteria are internationalism, the political recognition of the principle of dictatorship of the proletariat, rejection of bourgeois methods of control, such as unionism, parliamentarism and national liberation struggles, the recognition of the proletarian character of the October Revolution, the recognition of the need for an international communist party, as well as the rejection of bourgeois united front tactics. These are in fact, synthetically, class boundaries that distinguish proletarian organization from that of the bourgeois and the petty bourgeois. Inter-revolutionary debate is vital for the formation of the party. Not only are the pre-existing proletarian organizations coming from more or less different historical experience, sometimes converging and sometimes differing, but the struggles, themselves, spontaneously induce a section of the proletariat in struggle to politically approach the communist program. The debate therefore serves to confront divergent positions, pass on experience and political positions to the inexperienced and finally to clarify the communist program, that is to say the underlying politics that must be put into practice for the revolution. The purpose of debate between revolutionaries is not to attempt an eclectic mix of different experiences and political positions, but to further delineate the true communist direction from the sectarian and the opportunistic, and to discard the latter. We also agree that the development of a communist organization comes about through intervention within the class and through real struggles. Political clarification depends dialectically upon debate between communist groups and intervention in the class. The struggle against opportunism and sectarianism comes down to trying to restrict the influence, within the proletarian camp, of positions that oppose the fundamental political basis of the Communist Left. Sectarian and opportunistic political positions are unfortunately quite common in the proletarian camp. For example, from cliquishness (each to their own), to revisionism, modernism, going as far as liaisons with bourgeois political factions. Needless to say, the more that opportunism and sectarianism have their grip on the future party, the less able it will be to fulfill its revolutionary task. There’s a broad range of possibilities for collaboration between revolutionary groups. For example, it can take the form of joint intervention in a struggle with a leaflet on which there is mutual agreement. This can also take place through open political and public debate, in other words open to the class, on issues of political struggle and political regroupment. In short, any co-operation is advantageous to the consolidation of the class party. ICT, through its political experience within the Italian Fraction and Battaglia Communista, therefore from its historical experience, has a role to play in relation to emerging vanguard organizations, in aiding in their future development and growth. In a sense, its role is to take them under its wing so to speak, in order to pass on its political experience, as well as to participate with them in building an international communist party. - That each of the groups, Klasbatalo as well as the IWG, agree to review their past mistakes as well as the criticism so addressed, and that if found in error to refute them politically and publicly rather than by keeping silent. - It is necessary that joint work (translation, pamphlets, magazines, public meetings and especially interventions) between the IWG and Klasbatalo be advanced. It’s the IWG’s historic responsibility to agree to accept these proposals, or at the very least to discuss their terms. 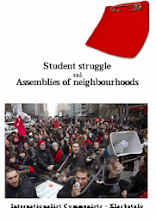 This booklet won’t go into a precise chronology of the 2012 student strike. Instead, what we’ll present is a political analysis of the struggle that unfolded last year. We intend this both as an assessment of the movement, as well as a preparatory tool for coming struggles. This booklet is very important for ICM as the habits and ideas acquired in Maoist groups block one’s understanding of Marxism and its implementation at the level of class struggle and the internal organizations of Left Communism.